The COCO-Text V2 dataset is out. Check out our brand new website! Check out the ICDAR2017 Robust Reading Challenge on COCO-Text! 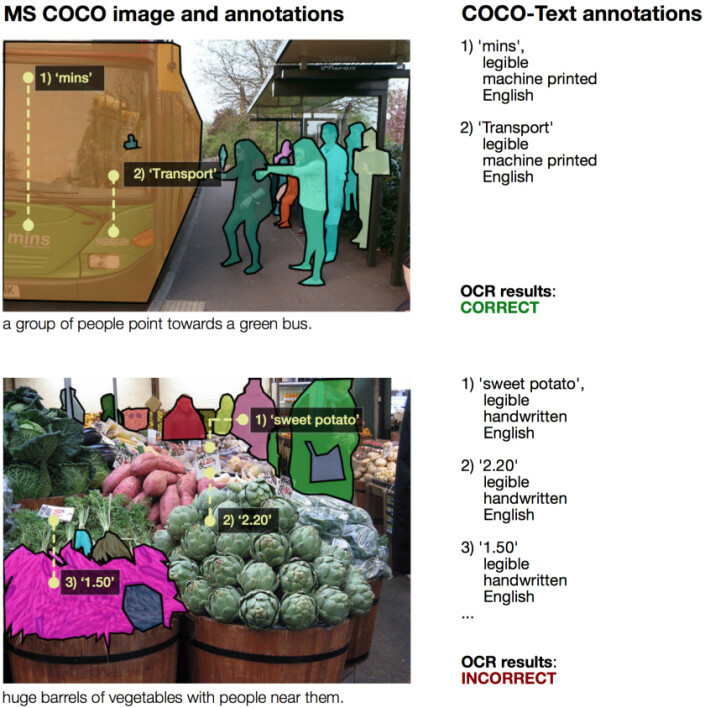 COCO-Text is a new large scale dataset for text detection and recognition in natural images. Version 1.3 of the dataset is out! 63,686 images, 145,859 text instances, 3 fine-grained text attributes. This dataset is based on the MSCOCO dataset. The annotations in this dataset belong to the SE(3) Computer Vision Group at Cornell Tech and are licensed under a Creative Commons Attribution 4.0 License. Cornell University CS Department MEng Report, 2016. For every image, we annotate each text region with an enclosing bounding box. For legible text we aim for one bounding box per word, i.e. an uninterrupted sequence of characters separated by a space, and for illegible text we aim for one bounding box per continuous text region, e.g. a sheet or paper. For the details of our crowdsourced annotation procedure, please see the COCO-Text paper. Please first download the annotations as well as the API. The COCO-Text API assists in loading and parsing the annotations in COCO-Text. For details, see coco.py and also the coco_text_Demo ipython notebook. loadAnns Load anns with the specified ids. loadImgs Load imgs with the specified ids. loadRes Load algorithm results and create API for accessing them. Each text instance annotation contains a series of fields, including an enclosing bounding box, category annotations, and transcription. The COCO-Text Evaluation API assists in computing localization and end-to-end recognition scores with COCO-Text. For details, see coco_evaluation.py and also the coco_text_Demo ipython notebook. The results format mimics the format of the ground truth as described above. Each result produced by an algorithm is stored in its own struct. The results struct must contain the id of the image for which is was generated. A single image can have multiple results associated to it. All results for the whole dataset are aggregated in a list of result structs. The entire list of structs is stored as a single JSON file.